It has been a while since I made a post! To say things have been hectic around here is an understatement. It all started on Thanksgiving when all six of our children were home. It was the first time in 6 years they had all been under one roof at the same time! I was ecstatic! But that wasn’t the only excitement…our baby girl became engaged. We are super happy for her but I am dreading the empty nest syndrome :/ They have set a May wedding date here in Georgia….let the planning begin! Not to be outdone, our oldest son called the following week to tell us that he, too, is now engaged. Wedding #2 coming in September in California. Might as well fill up the 2017 calendar all at once, right? Wedding #3 will be in November. While it is not “ring on the finger” official yet, our youngest son says they are already making plans. Their wedding will be in Tennessee. Whewwww……it’s going to be a busy year! Speaking of busy, I usually make a lot of our Christmas gifts. This recipe is one I tried this year and I really do like it. At first, it feels very oily, but it absorbs quickly and is great for those really dry places. In a small bowl, add the magnesium and boiling water. Stir until it is completely dissolved. I had a few stubborn flakes and ended up putting it in the microwave for a minute. Once it is dissolved, set aside. The next step is to melt the oil, beeswax, and shea butter. 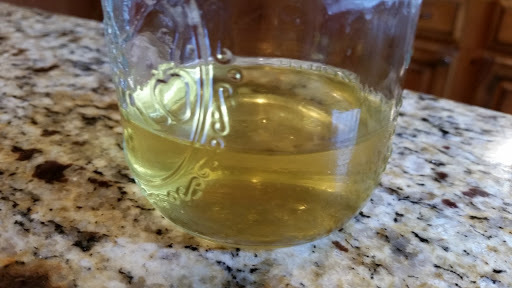 This can be done in a double boiler or you can do what I did….place the ingredients in a wide mouth pint jar, set the jar in one inch of boiling water and let it melt. It will take 3-4 minutes. With an immersion blender using an up and down motion, mix the ingredients until they are thoroughly combined and emulsified. Scoop into two 4 oz jars and let cool completely before placing the lid on top. Why add magnesium? One of our older daughters has been doing a lot of research on magnesium deficiencies due to symptoms she was having. While I haven’t spent a lot of time on it, I have read from numerous sources that most adults do have some level of magnesium deficiency. This is an additional way of absorbing magnesium into your body.